Our 75th anniversary celebration weekend is just around the corner! One of the songs we will sing this coming Sunday morning is an old Church of God heritage hymn entitled “The Church’s Jubilee.” It’s a song that I grew up singing in my home church. Perhaps you remember it well, also. But we have not sung this song at all – not even once – in my time as pastor of this church. This Sunday will be the first time. I’d like to take this opportunity to explain why. First, why have I avoided scheduling “The Church’s Jubilee” for the past eight years? The primary reason is because the lyrics may be confusing for those who hear them. Another reason is that even if we do understand the lyrics, we may not agree with them. The glories of fair Zion’s state ten thousand voices tell. Three key words appear in this first verse: “eventide,” “darkness,” and “Babel.” The early leaders of the Church of God believed that all of Christian history could be compared to the span of a single day: dawn, morning, daytime, afternoon, evening, nighttime. They believed that they were living in that nighttime (or “eventide”), the last few moments before the new day begins. This new day would be marked by the return of Jesus and the end of the age. Church of God people believed that Jesus was returning soon, and that in these final days God was shining the “light” of his salvation into the “darkness” of the present age. This perspective caused these leaders to look back on the previous 1800+ years of Christian history in a specific way: those who came before them did not have as much of the “light” as they did. So they looked back on previous generations of Christians with skepticism, distrust, and even a little condescension. The word “Babel” also had a special meaning in the early days of the Church of God. “Babel” refers to the Tower of Babel story in Genesis 11, as well as the symbol “Babylon” found throughout the book of Revelation. (In Revelation, “Babylon” is itself a symbolic reference to the Babylonian empire which had conquered the Israelites several centuries before Jesus.) For the founders of the Church of God, “Babel” represented the “confusion” that was present in all the various systems of Christian denominations: Roman Catholicism, Presbyterians, Lutherans, Methodists, and on and on. These were called “confusion” because of their reliance on rules and structures and rituals. These man-made instruments of religion only served to “confuse” the truth of the gospel of Jesus Christ. Church of God people believed that God was calling them to leave “Babel” and join the true church, the one church, the undivided people of God, led by Jesus Christ alone. The Bible is our rule of faith and Christ alone is Lord. All we are equal in his sight when we obey his word. And to each other and to God eternal trueness vow. The day of sects and creeds for us forevermore is past. God’s unity joins all the saints upon the world so vast. “Sects” refer to those denominations, that “Babel confusion,” out of which the early Church of God leaders were called. 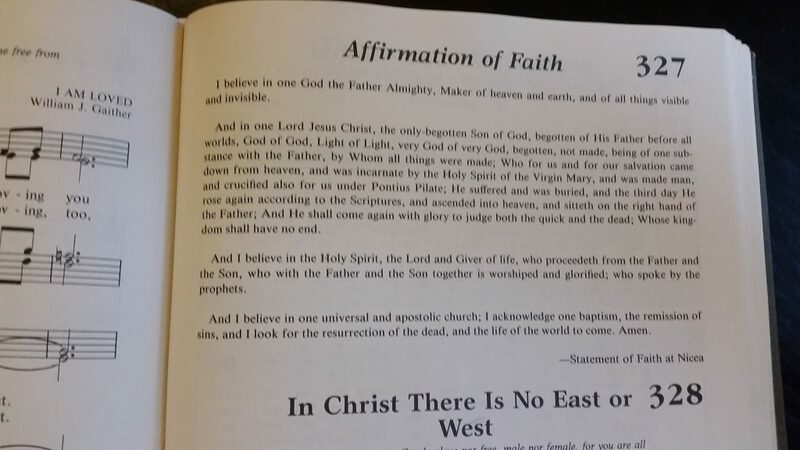 The term “creeds” is a shorthand term that refers broadly to the rituals and practices of these other denominations – including things like the Apostles’ Creed or the Nicene Creed. Our founders reacted quite strongly against anything that smelled like a “creed” to them. Creeds are summaries of Christian faith which were taught to and memorized by children and new converts. They are very old, dating to before the invention of the printing press, going back to a time when most people were illiterate. How else were people to learn a summary of the Christian faith? But in the late 1800s, printed Bibles were everywhere, and English-speaking people (like our predecessors) could read it in their own language. And if God had spoken his word to us, who were we to try to summarize his message with some man-made creed? While in the holy Church of God we hear our Savior’s voice. Oh, this fourth verse started off so well. But its last line just muddies the waters. Who are “Babel’s lords,” and what are their “yokes”? Well, if you’ve followed this train of thought so far, you might understand that “Babel’s lords” were understood to be people like the Pope (the leader of the Roman Catholic Church) and other denominational leaders in similar positions. Our founders rebelled against the idea that any human being could force God’s people to worship, to behave, or to believe in any particular way. They just weren’t having any of that. O Church of God, the day of jubilee has dawned so bright and glorious for thee. Rejoice, be glad! The Shepherd has begun his long divided flock again to gather into one. The “day of jubilee” is a reference to an Old Testament practice (see Leviticus 25), in which every 50 years all debts would be forgiven, all land would go back to its original owner, all slaves would be set free, and so on. The “jubilee” was basically a celebration of pushing the metaphorical “reset” button on everything. It was God’s way of ending disputes, of setting things right, of bringing restoration and wholeness of life to his people. The early Church of God leaders thought they were living in the earliest moments of that “day of jubilee” – the day that follows the “eventide” which is quickly fading away. In short, this hymn is somewhat problematic for us today. First, we don’t always remember or understand what this song is really about. And second, we don’t necessarily agree with the beliefs of our founders – for instance, I don’t agree that the Pope is the Antichrist, hell-bent on destroying all the good work of Jesus in this world. We need to be aware of what we sing, and be in agreement with it, so that we can join in with our full selves. So that’s why I haven’t scheduled “The Church’s Jubilee” for these past eight years. Why, then, are we singing it this Sunday? I’m glad you asked. This song came to my mind because one of our church people told me she has had it stuck in her head for quite a while. She asked if we could sing it in church sometime. And it just so happened that I was planning the Sunday worship service for our 75th anniversary weekend at the time. I asked her why she liked the song, and she pointed to the joyful, expressive music and the way the lyrics point to the unity of God’s people. I agree – on those levels, the song is quite good! Another reason is that Mt. Haley sang “The Church’s Jubilee” at our 50th anniversary worship service back in 1993. (We have posted a bulletin from that service on a bulletin board in our narthex, in case you’d like to see it.) Singing it again at the 75th anniversary is a way of celebrating our heritage, connecting with our past, and reminding ourselves that we are part of something bigger than ourselves. So we’ll sing “The Church’s Jubilee” for the first time in my pastorate this coming Sunday. I hope this discussion gives you some insight into what the song is about and why we’ll sing it together!